Those Poindexters at Nokia Research are working on a Superhydrophobic coating for the company's handsets. The coating is based on the nano-technology found in lotus leaves. With a contact angle of about 180 degrees, liquids will turn into drops that seem to slide right off a surface. The process is similar to how a hydrophobic Teflon coating works, but with the Superhydrophobic coating, there is a layer of air that traps the liquid and keeps it from touching the surface. The Nokia Research team has applied the coating to a Nokia Lumia 710 and watching the video, you can see how well it works. The one problem is making sure that the nanostructure can survive the daily wear and tear of smartphone use. 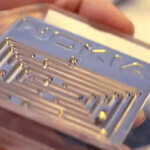 Nokia Research said it is close to perfecting a Superhydrophobic coating that will last on the surface of a phone. While the Superhydrophobic coating won't let you go swimming with your phone, it will let you drop it into your morning cup of Joe and still survive. It will also keep your phone clean of those disturbing fingerprints and will also cut down on reflections. The one thing that Nokia hasn't been able to replicate in the lab is the lotus leaf's ability to repair itself. If the crew at Nokia Research figures that out, you can just imagine the implications. Wow... a self repairing device.. Imagine leaving it in your drawer because you don't want to bring it due to some scratches made by your spoiled kid, then the next day you pull it out and find it scratch free. I think I've read something about an iPhone case made by Nissan sometime before.. Wait lemme research it. EDIT: Yup definitely existing. You can Google it, there are a lot of info on it. Here's one to save trouble:http://techcrunch.com/2012/01/17/nissan-scratch-shield/ Anyway, this tech rocks! @Lucas777 Self healing glass!? Over the roof dude! Not only useful in cellphones but also in a lot of other things.. reading glasses, binoculars, camera lenses, etc. @shadez10 (post14) It's not a perfected technology yet. But surely it can self-repair "fine" scratches. It's a different story if you want it to recover from deep scratch, like caused by a blade. Who wants to invest heavy amount to a case and make phone even bulkier when a phone can do the same without a case and infact doesnt even need a case. Isnt it brilliant ? - Lite, better, scratch proof, no more spending and living up to the phone's cool looks with Rough usage is just Amazing! They should also manufacture underwater enclosures as accessories for the phones. My dream is finally about to come true.